individuals are supported by Impact NW’s Seniors Services programs each year. rides are provided to clients who need help getting to medical appointments or performing errands. events per year are organized for participants of Club Impact, a social club for young adults with disabilities. Impact NW’s programs take a holistic view of healthy aging, addressing each client’s physical, mental and emotional well-being. We are committed to helping our region’s most vulnerable seniors access resources that enable them to remain in their homes successfully, while still being able to participate in the community in which they live. We provide advocacy and case management to seniors aged 60 and older. Impact NW’s Seniors program gives clients the tools and support they need to be healthy, happy, and active, and to live at home safely. If you or someone you know is interested in Impact NW’s Seniors programs, call us at (503) 721-6760. Your conversation will be completely confidential, and if Impact NW isn’t the best fit for you, we’ll help connect you to the services you need. Services: On-site support for residents living in Dahlke Manor, Grace Peck Terrace, Rosenbaum Plaza, and Unthank Plaza affordable housing complexes. Services: Guardianship and conservatorship services for otherwise self-sufficient seniors. Senior Guardian Assistance (Senior GAP) offers money management services for seniors who are otherwise self-sufficient but struggle to manage their own financial affairs. Advocacy & Case Management Services provide consultation, assessment, and advocacy to help individuals aged 60 and over and families identify and address service needs and to do long-term care planning. Congregate Housing Services helps seniors and adults with disabilities living in public housing through in-home care coordination, transportation to shopping and medical appointments, money management & legal services, and on-site meal services. Transportation Services provide more thousands of rides each year to seniors and adults with disabilities who need help getting to medical appointments or performing errands. 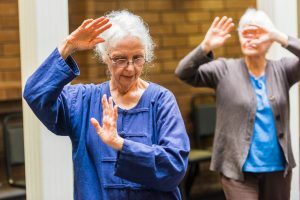 Activities & Health Promotion at our Southeast Multicultural Center provide a hub of activity where seniors gather for exercise classes, meals, games, celebrations, and friendship. Club Impact is a social club for adults with disabilities that provides activities to nurture healthy relationships among participants.